Sim Master device with full licenced software. Every mobile phone user is familiar with the difficulties of entering names and phone numbers on those tiny, hard to use, numeric keypads. We have unique solution. 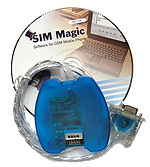 Sim Master enables any mobile phone user to painlessly edit, copy, or backup all the information stored in their mobile phone using any standard PC. This sweet looking device is a real treasure. SIM MASTER has not only stylish form but is very useful. It is compatibile with all GSM cellular phones. Compatibility with all GSM cellular phones. The legislation of some countries forbids creation and-or use of clones GSM Sim-card and-or Sat-TV card (read laws !). All backUp function support A3A8 COMP128V1 SIM Card only. This SIM Card Back-UP device doesn't support newest SIM Card that uses COMP128V2 algorythm to code KI key. Some GSM SIM Cards from 2001 (COMP128V1) are Scan-Limited. It has limited running scan 65536 times. If the scan is over 65536, the SIM Card will be locked. This SIM Card will not work any more.